Details define the man; a signet ring, an earring, a pocketknife, or a sword each speaks to a different audience and at once can give clues to membership with a particular social group. Prior to the nineteenth century, a sword worn at the side was the mark of a gentleman, much like a blazer or jacket is today. Even if a jacket is not normal wear for the individual, donning it creates instant acceptance in certain social gatherings. Just as with a jacket today, at the court of Versailles, any man dressed cleanly and with the requisite sheathed sword worn at the side, whether owned, borrowed, or rented could enter the chateau. Which leads to the point of this blog…Beau Nash, the master of ceremonies at Bath in the beginning of the eighteenth-century forbade the wearing of a sword for men at social gatherings at the spa. The point of social gatherings was social exchange and while any man could rent or own a sword, he felt only the nobility and gentry knew how to move in a room with one. The new-comer, unused to the movement of the side sword was instantly recognized as an interloper, not as a member. There are of course a thousand ways that members of a group spot an interloper, but by forbidding the sword Nash in effect established that an invitation was the criterion, not the accoutrement. By leveling the field a bit civility stood a better chance of developing. In time, particularly in civilian life, the sword would be required only at court functions, where it remained as a mark of chivalry. However, at the beginning of the eighteenth-century the requirements of etiquette were in flux, but not the idea of civility. Conceivably, the rented sword at Versailles allowed any man, by blending into the crowd of hundreds or even thousands of similarly dressed men, to visit and see the court with some degree of comfort. Conversely by banishing the sword Nash provided a degree of comfort in smaller quarters and instigated a trend that would in time become the established form of social dress. Although differing in approach, both options provided greater attendance, which is the object of most public gatherings. Now where did I leave that mug of tea...? This eye catching, gay ensemble was worn by 12 year old Louise Carnahan (1866-1937; later Mrs. Deming of New York) to the wedding of her uncle Oliver Hanna in Fort Wayne, Indiana. 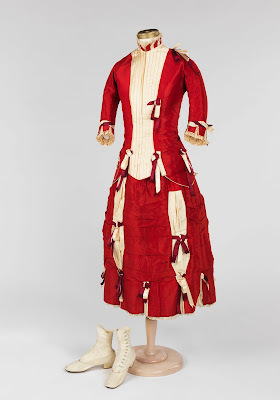 It was a winter wedding held on December 5, 1878. 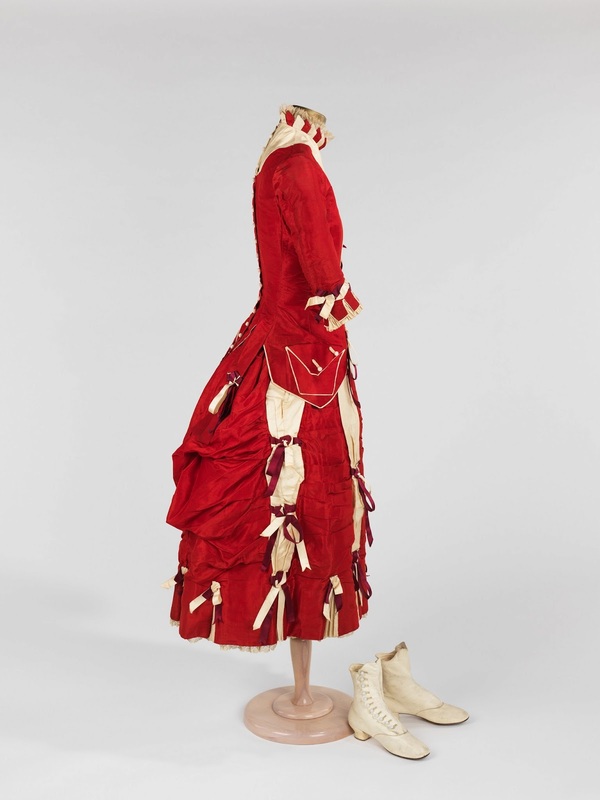 Having a well-documented provenance conjures up an image of this young woman: Can you imagine being a Victorian teenager, skipping, prancing & preening (under many a watchful eye no doubt) in a red & white silk dress with stylish grown up boots? She was most likely quite excited about the event. The color combination would have looked chipper, right down to the snow white boots. As noted by the Metropolitan Museum, even the addition of the dickey smacks of high style. I decided to follow a (brief!) research tangent related to Louise’s ensemble for her uncle's wedding. Located her obituary and learned that her father, William Carnahan, was one of the largest shoe and boot distributors in Indiana at this time. 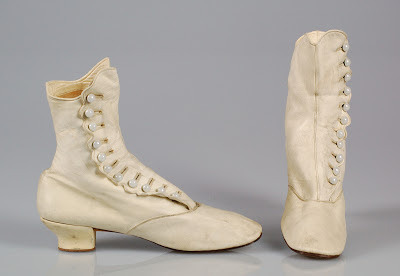 Already interested in her lovely white 11 button leather boots, with their 1.5 inch heel, her father's business made them that much more intriguing...Do not know if I will pursue this further, but wanted to share with you, kind readers, just the same. Photographs of the dress & boots are courtesy the Metropolitan Museum of Art.